As a Reiki Practitioner, I know that my ability to help the people and animals that come to me is a reflection of my daily self-care routine. If I am committed to my daily meditation practice and if I am striving to live by the Reiki Precepts, I am better able to help the people and animals that I serve. Self-care is one of the most important things I can do in the pursuit of living a purposeful life. I’ve spent many years trying to really grasp what I bring to the world around me. Today, I’m confident about my purpose, but there was a time in my life when I had no idea what I had to offer. I was busy distracting myself with other things and other people. I did not know that the bright light inside me was there, or that it was holding all the answers I was seeking. I couldn’t see the light because it was hidden under layers of grief and anger and worry and fear. Today, I know my self-care routine propagates what I’m able to bring into the world around me. I’ve always had a love of gardening and flowers – a passion that I credit my mother for cultivating. This winter, I planted two raised beds with onions – lots and lots of onions. I had a few left over so I planted them in a barrel. The important thing to note is that I had removed the soaker hoses in the raised beds for the winter. The barrel had a drip sprinkler head in it that was attached to the sprinkler system, so it remained. Over the winter I would hand water the beds – when I remembered. I usually found myself making excuse. “I’m tired. I worked all day. It’s cold. It will take five minutes, I’ll do it tomorrow before work.” I had lots of excuses why the beds were watered unsystematically but none of them were very good reasons. The barrel was a different story. It was on the sprinkler system. The onions in the barrel received water at the same time, on the same days, for the same amount of time – five minutes. The onions in the barrel were watered systematically. Other than the water, everything else was equal. All the onions received the same day and nighttime temperatures. They all received the same amount of sunshine, and they all received a regular good morning from me as I hurried off on my way to work. At a minimum, the care the onions received was acceptable. 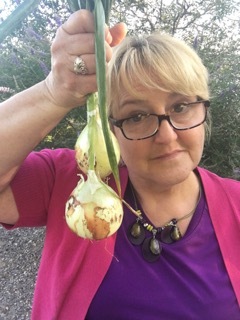 I share this with you, not just because I like talking about my garden; I share it with you because our self-care is just like these onions. I couldn’t see it from my day-to-day perspective, but when it came time to harvest the onions and pull them up, it became very clear. The onions in the barrel – the ones that received consistent care – were three times the size of the onions in the beds. Now, the onions in the beds were an acceptable size, but only acceptable. The onions in the barrel were huge! The onions are much like our lives. We can go through life, taking care of the spirit inside us unsystematically, and we will still produce, we will still have accomplishments in our life. But when we compare it to the live we are capable of living, it will be a life of mediocrity. Or we can go through life, systematically caring for ourselves on all levels – body, mind and spirit, and live a life of excellence. To live a life of excellence, there is only one question we need to ask ourselves.